The infrastructure of an office space relies heavily on scalable and flexible results. VELCRO® Brand products provide easy and fast solutions to your installers, ultimately saving them time and money. Help your contractors be competitive and provide them with a reliable, versatile, product without compromising on quality. Ensure wayfinding and other informational signage is securely positioned and hang signage with VELCRO® Brand adhesive backed hook and loop. With a wide array of adhesives, VELCRO® Brand hook and loop can withstand all types of weather conditions and varied levels of humidity. Provide your installers with a sustainable solution that not only lasts but gives your clients the flexibility to adjust and reposition signage after installation. Ultimately saving them time in the installation process, while minimizing damages to buildings and poles. Security begins outside of the building and is a high priority for the office. Installing outdoor cameras and other security measures, like badge readers, are a must to promising security but can be difficult at times. With the wide variety of VELCRO® Brand hook and loop, this fastener can help reduce vibrations and allow your installer to reposition the camera at any time, making it simple to install or readjust. Not only can VELCRO® Brand adhesive backed hook and loop be utilized outdoors, but it can also hang signage within the office. 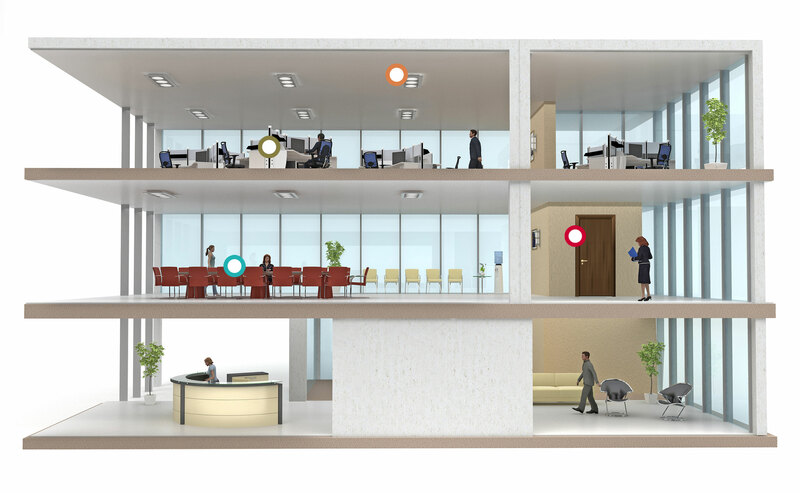 Floor plans and even fire-life safety displays can change within a commercial space, leaving your clients in search of a solution that allows for flexibility and scalability. With VELCRO® Brand adhesive backed hook and loop, signage can be removed, replaced, or repositioned quickly and efficiently. VELCRO® Brand solutions range from a variety of durable connections, including carpet tiles and even football stadium turf. Carpet installation is simple with the VELCRO® Brand hook and loop rolls. By using hook and loop versus traditional carpet glue, installers can quickly lay down rolls of carpet with minimal labor put forth. Provide your installers with a cost-effective, labor-saving, and reliable solution. Cubicle installation can take a long time when attaching the fabric paneling to its frame. with VELCRO® Brand hook and loop 88/1000, your installers can affix the fastener to the fabric paneling, and installation time can be cut in half. Manage all types of cables including ethernet, telecom, and power using the VELCRO® Brand ONE-WRAP straps. For years, the VELCRO® Brand ONE-WRAP® straps have served as an adjustable and reusable solution for cable management. The ties are pre-cut to minimize accidental cable damage and unlike enclosed solutions, the VELCRO® Brand ONE-WRAP® straps allow your installers to see the entirety of a cable – without needing to untangle it from others. Use VELCRO® Brand ONE-WRAP® to quickly manage these pathways as well as add and/or re-route cables in the future. All air handling spaces need a flame-retardant solution when managing pathways. The VELCRO® Brand FR/UL ONE-WRAP® fasteners are the ideal solution to secure copper and fiber cabling within these spaces. These fasteners are the only of its kind to meet Section 300.22 (C) and (D) of the National Electrical Code’s requirements, leaving cabling organized and fire retardant. It’s important to build IT infrastructures that are reliable and secure. A large part of this process is managing pathways. Zip-ties may seem great in a pinch, but as a single use solution, they can put stress on cables and ultimately lead to the cables breaking down. A great solution is the VELCRO® Brand ONE-WRAP® tape and straps, which can assist in this organization, making installation fast and simple. In today’s modern age desks and conference rooms require power strips, video cables, phone cords, and even docking stations. With an abundance of cords to manage, your installers need a solution that is both efficient and reusable. VELCRO® Brand ONE-WRAP® straps and ties allow your clients to quickly tie up cables, not once but multiple times. Keep the conference area clean, organized and efficient with VELCRO® Brand ONE-WRAP®. Office spaces can be quite labor intensive but with the right VELCRO® Brand solutions, you can help your installers save time, labor, and ultimately money.